Video images on the website of public broadcaster France Televisions showed two gunmen in black at a crossroads who appeared to fire down one of the streets. A cry of “Allahu akbar!” — Arabic for “God is great”— could be heard among the gunshots. 12 murdered, magazine staff and several policemen. The obviously well-trained and very professional terrorists, who spoke perfect French, escaped. 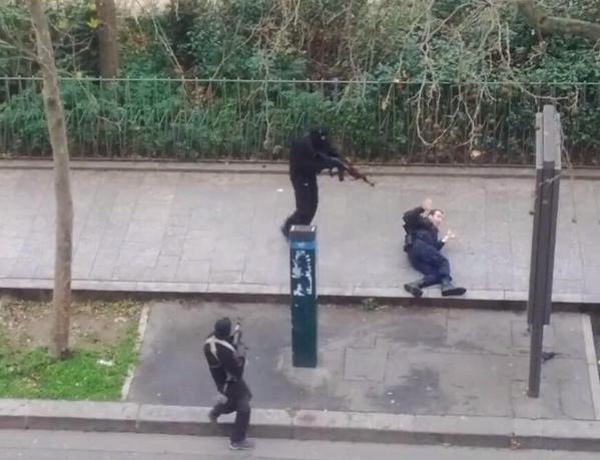 Islamist terrorists finish off wounded policeman. 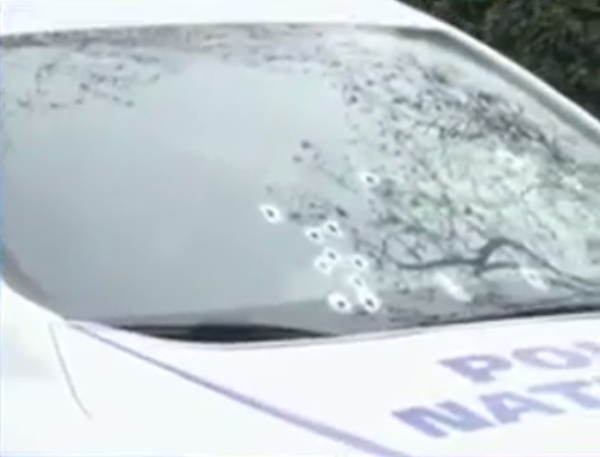 Windshield of police car. The terrorists were not amateurs. Will anyone in Europe dare to express themselves publicly in a way that will arouse (the very easily-aroused) Muslim rage again? 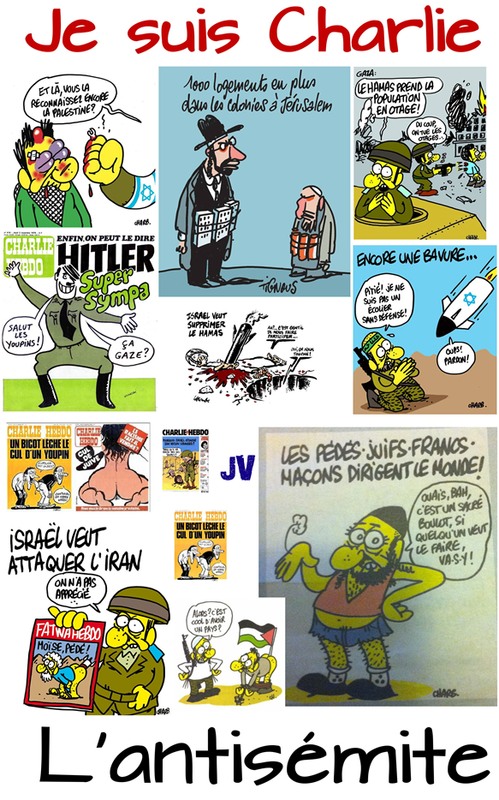 I doubt it (thank goodness that in Israel we can draw whatever cartoons we want. We can’t make them want to murder us any more than they already do). Now we will begin to hear the condemnations around the world. I hope officials will be able to keep themselves from urging ‘restraint’, and from talking about how these gunmen besmirched ‘true Islam’. We’ve heard more than enough of this. But whatever they say won’t count for much unless there is effective action taken against the sources of incitement. Just as one can’t draw a cartoon that, according to their definition, insults Islam, we, the civilized world, should define language that we will not permit. Close the mosques, deport or imprison the instigators, kill the terrorists. They claim that they are oppressed? Show them what real oppression looks like. Give them terror for terror. And although I don’t want to inject my own concerns into this too much, perhaps they could support us in Israel who are facing the same — identical — barbarian horde, instead of falling over themselves to create a new nest of terrorists next door to us. Unfortunately, I do not have a fresh take on this. I don’t have any original ideas. I think, though, that ‘modern’ approaches fail when you are dealing with this kind of subhuman behavior. “But that will make us like them,” is the response. Possibly, but if we allow them to overrun us, what’s the difference? We are dealing with subhuman barbarians. They think we are all expendable and prove it by murdering everyone they disagree with. It is time the favor were returned. The world needs to get serious and start hitting back. We can no longer hide behind the excuse of our “enlightened humanity,” because they count on it. The world has lost the will to fight, and without it there is no survival. Welcome to WW3. The stage is set for the Muslims and their allies to begin the slaughter. It isn’t long now. The world sits back and watches Israel do all the heavy lifting and the real work, then it condemns Israel for saving them. Again. The time to stand up is here. My bet is Obama will do and say nothing. He is a coward and he supports their aims. Whatever is easiest is what he does. Right and wrong don’t even enter into it. Of course muslim leaders will be happy to come out and say they condemn violence. Anyone can do that. What they should be asked to do is to acknowledge our right to satirise and offend. Gee, that vote France cast in favor of the PA on the UNSC sure did them a lot of good, didn’t it? I agree completely with the recommendations made by Vic above, and no, it will not ‘make us as bad as them’. We’d have a very, very long way to go beyond what Vic recommends to reach that point. There is this set of documents known as the Geneva Conventions, governing the ‘moral’ conduct of war (e.g., not deliberately attacking civilians, humane treatment of prisoners, etc.). Many countries have signed onto these, though there are some that have not. One aspect of international law where the Geneva Conventions are concerned, that is frequently overlooked, is that any entity that has NOT signed onto these is not entitled to the considerations contained therein by those that have. In other words, the fact that we in the U.S., for example, have signed onto these does not obligate us to observe them when we are in combat with an adversary that does not recognize them. This is why, for instance, there was such great disparity in treatment of Japanese versus German/Italian POWs by the U.S. during WW2. Some say this was ‘racism’ – and perhaps that played some role – but the fundamental reason was that Japan did not recognize the Geneva Conventions, and their treatment of Americans and others they captured reflected this abundantly. So we ah, ‘returned the favor’ (and even then, we were far more humane to Japanese POWs than they were to our guys). What makes this relevant to the situation we are in today is that where our Islamist adversaries are concerned, they don’t give a fiddler’s fart about the Geneva Conventions or anything else besides their medieval interpretation of Islam. So, we owe them NOTHING. That is why I considered the recent hearings over the interrogation techniques used by our CIA, etc., against the likes of Al Queda, to be nothing short of obscene. OF COURSE we tortured them. And if it got us useful intelligence, WE SHOULD CONTINUE TO DO SO. These particular ‘enemy combatants’ have NO RIGHTS under international law. There is no legal basis whatever for us to show even the tiniest amount of restraint in dealing with these savages. So far as I know almost all the media in Arab and Islamic countries are filled with racism and anti- Semitism. So far as I know this kind of incitement has been going on for years. So far as I know the Muslim populations are growing everywhere in the world, including the free world, including the United States and Israel. So far as I know there is no way to close down every mosque without raising questions of freedom of speech and religion. But in Israel itself in our holy city of Jerusalem the worst kind of incitement goes on unpunished. An Arab member of Knesset can rise a ‘Palestinian flag’ on the holiest site in Judaism where no Jew can even open a prayerbook without being arrested. I have just begin the list and I will not go on. But the point is that there has been and there is so much going on which is ‘wrong’ in relation to the Muslim world and by Muslims , whether individuals organizations or governments that any suggestion of a single answer is not going to get us very far. Perhaps a courageous President of the United States who would be willing to call Islamic Terror that and take concrete steps to halt it, and the incitement that is part of it would be a first step. PS Perhaps a fair beginning would be to say that at the moment followers of Islam are the greatest problem the world faces. And this instead of those kind of vague cop-outs which refuse to specifically point to ‘Islam’ and instead go on about ‘Not all Muslims are terrorists’ something true but irrelevant. the total perversion of France !